Certified Personal Trainer Exam | What's On The NFPT Test? The NFPT-CPT exam is designed to assess the understanding of fundamental exercise science principles and training methodologies for safe and effective fitness program design. The Certified Personal Trainer, CPT, designation assures a level of competency to stakeholders (i.e. consumer/public, employers and regulatory agencies) of on-the-job requirements of the Certified Personal Trainer. Successful completion requires that you demonstrate an understanding of general competency skills for job performance through NFPT’s legally defensible and expert developed examination. These skills include, but are not limited to, applied exercise science (e.g. anatomy, physiology, biomechanics), training methodologies and fitness components, injury treatment and prevention, and professional practices. NFPT conducts a job analysis survey in order to establish industry-based knowledge, skills and abilities (KSAs) of the entry-level certified personal trainer. Research data is used for NFPT-CPT exam development. NFPT test candidates are measured against standards that are reflective of the level of competency and skill sets required by the industry entry-level personal fitness trainer. recognize the talent, skill and ability of those who meet the standard of competency and demonstrate the desire to help others achieve their personal health and fitness goals. NFPT supports continued growth and development, both personally and professionally. 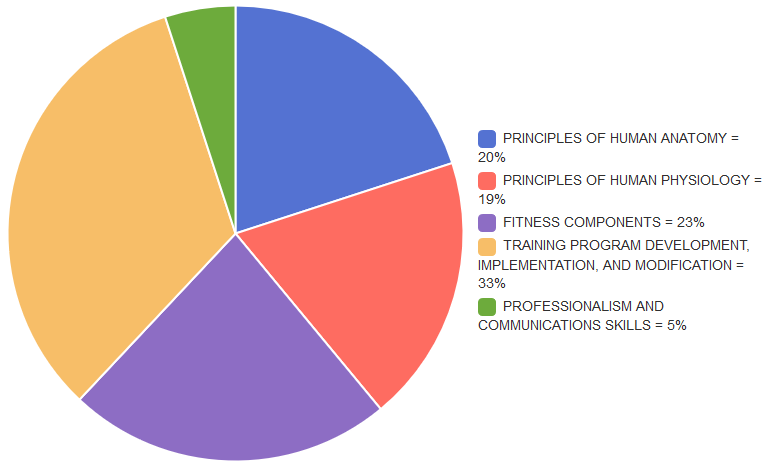 120 multiple choice questions that come from 5 fitness training categories, see the pie chart below for these exam categories and what percentage of each subject is on the exam. With your certification package, you receive a detailed breakdown of each of these 5 categories to use as a checklist through your studies. After you take the exam, NFPT provides you with a score report that informs you of how well you performed in each of these categories. The exam is closed-book with a two hour time limit. There are 1000 total possible points on the exam, 750 points are needed for successful completion. Human anatomy is the scientific study of the form and structure of the human body. Whether at work or rest, in peak condition or not, the human body is an amazing example of coordinated systems acting together for one purpose – your body is very much like a machine, with many working parts that come together for its overall benefit. Learn just what you have at your disposal in a human machine that works by design to perform voluntarily at your command, and involuntarily to sustain life. NFPT provides you with insight on the most vital parts related to fitness programming. Human physiology is the scientific study of the activities and functions of the human body and its support systems. Every breath you draw, every beat of your heart, and almost all the calories you ingest are means by which to sustain life on a cellular level. Approximately 60% of the total amount of cells in the body are muscle tissue cells, demanding the constant attention of all of the support systems in the body. The human body is a fascinating collaboration of necessary systems functioning in concert. NFPT education will break these system processes down in a comprehensive way that will stimulate your desire to learn. This area of study is the place where anatomy and physiology meet in order to appropriately design, gauge and maximize fitness programming for specific needs, abilities and goals. NFPT education lays out a foundation for applying your knowledge to actual fitness screening and design. The 5 components of fitness are discussed in detail: Cardiorespiratory Conditioning, Muscular Endurance, Muscular Strength, Flexibility, and Body Composition. Recognizing and applying these components is essential to understanding how a training program works on an individual level. Now it’s time to put your knowledge to the real-world test – assess a client and implement an appropriate exercise program according to their goals. NFPT provides a step-by-step screening and consultation process that is recommended before the implementation of any exercise program. Knowing “how-to” will take a foundational understanding of theory to a whole new level of success in practice. Remember, RESULTS = RETENTION. NFPT walks you through how to develop, implement and modify the training program for long term results! Utilizing the appropriate communication skills will help you to apply problem solving techniques that can be tremendously valuable in the field of personal training. Effective communication is critical to the motivational aspect of exercise effectiveness. Whereas maintaining professional standards and staying within your scope of practice is a personal responsibility of the profession that provides protection to both you and your clients. NFPT walks you through the basics of strategies for effective communication, professional conduct and legal considerations that are often times taken for granted and not realized as such key factors to trainer success.